The 2018 George Washington Colonials were never expected to go anywhere. Jennifer Rizzoti’s bunch lost three key seniors from 2017, and were picked to finish in 6th place in the Atlantic 10-right in the middle of the pack. The conference this season, as it would turn out, would be very top-heavy, and be dominated all season long by Dayton, who finished conference play 15-1 and 22-5 overall. In addition, Duquesne, Fordham and George Mason all finish the regular season with over 20 wins. Each of the four aforementioned teams finished in the top four of the conference and it looked like the heavyweights were going to battle it out for A-10 supremacy in Richmond. GW on the other hand? The Colonials were an afterthought when it came to predicting the A-10 Tournament. They had let a chance to secure a top-four conference finish slip through their fingers in their regular season finale, where GW put forth a rather lackluster performance, falling to Richmond 49-36. Any momentum the Colonials may have gathered down the stretch of the season appeared long gone. A bid to the 64-team WNIT didn’t even appear to be a guarantee as conference tournament time rolled around, especially given how poorly the Colonials looked in their final outing. A team that had been middle of the pack most of the year looked like their season was going to come to an abrupt end, and soon. Or at least, so we all had thought. So what did the Colonials do? They turned the entire conference upside down, defeating two of the top four-seeds in the A-10 en route to the championship game. There, t met fellow-Cinderella, Saint Joseph’s, making history for the lowest-seeded A-10 title game in conference history. The lowest seed ever to win the Women’s A-10 Championship was fifth-seeded West Virginia in 1989. Yeah, the Mountaineers were once members of the Atlantic 10. 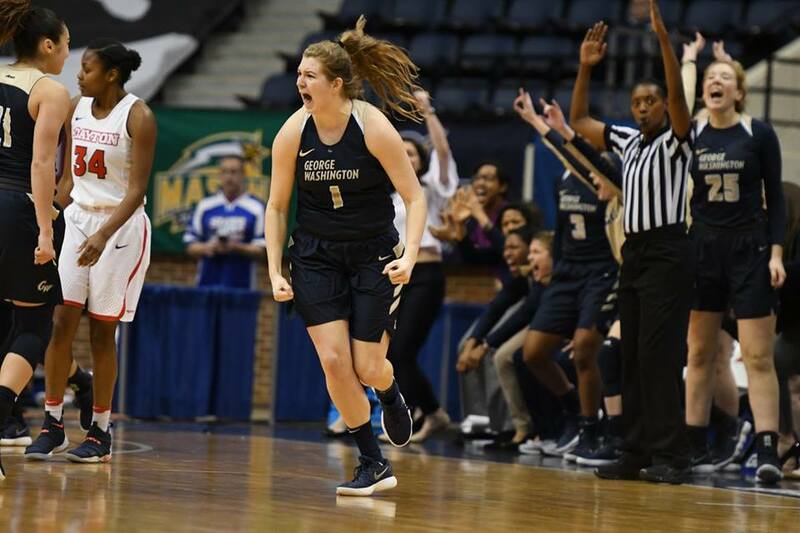 None of the girls on the GW roster were even alive at the time that West Virginia won the title, and now the Colonials have written their own fairy tale, and are heading to the NCAA Tournament for the third time in four seasons. While George Washington may have a recent history of A-10 Tournament success and postseason appearances, the back-to-back champions of 2015 and 2016 were backstopped by current WNBA All-Star, Jonquel Jones, not to mention Caira Washington, Shannon Cranshaw and Hannah Schaible and Lexi Martins. Those were nationally-ranked teams that, had they not won the A-10 title, would have easily received at-large bids to the NCAA Tournament. This team was anything but a lock for any postseason appearance at all, and it showed in their approach to each game throughout the conference tournament. They knew it was win or go home, and GW played with such tenacity and determination that they simply just would not be stopped. But what is the lesson from the upstart Colonials? As cliche as it sounds, it’s that in March, anything is possible. Seeding, regular season records, none of it matters once tournament time comes. Everyone is set back to 0-0, and has to win in order to stay alive. And as proved once again in this year’s Women’s A-10 Tournament, having a bye isn’t always the best thing, as other teams are playing and gaining momentum while you are sitting on the sidelines waiting. Crazy things happen all the time in March, but it’s quite easy for forget that literally everyone has a shot at winning a championship. You could go 0-16 in your conference, win your tournament, and then, theoretically, win the NCAA Tournament. Sure, it’s highly improbable, but the system is designed so that it is possible. Cinderella teams, such as George Mason men’s basketball from 2006 are often view in hindsight as a good team that was highly underrated before the tournament. But a run to the Final Four sure changed a lot of people’s opinions, especially since a considerable margin of people didn’t believe the Patriots belong in the tournament in the first place. If in mid-February of 2006 you asked Mason fans if they thought their current team was the best team to ever play in Fairfax, I doubt many would’ve said yes. But now? The 2006 Final Four team is, for obvious reasons, heralded as one of, if not the best mid-major teams ever, not just from GMU. The point is, if you’re a fan of a team in the Atlantic 10, there’s a decent chance your team isn’t one of the top four teams in the conference. Your team may even be stuck playing in the extra games on Wednesday night. But especially in a year like this one, where the conference is as wide open as it has ever been, almost every single team has a shot to at the very least make the A-10 semifinals. This is the time of year where the near-impossible happens on a daily basis: that’s why we all love it so much. Every team has the chance to put it all together and make something special happen. Just because your team isn’t in the NCAA Tournament conversation now doesn’t mean they won’t be come Selection Sunday. Buckle up folks, because this March is already shaping up to be one of the best yet, and we’re just getting started.